The German cellist Annlies Schmidt de Neveu was born in 1915. Emanuel Feuermann was her teacher. As well as being a cellist in several German orchestras, she also forged a limited solo career, giving the German premiere of Jean Françaix’ Fantasie with the Berlin Philharmonic under Sergiu Celibidache, and the French premiere of the Samuel Barber Cello Concerto. From 1968 to 1980 she taught at the Karlsruhe Music Academy, and was a member of the Karlsruhe Knieper Trio. She died at the age of ninety-five in 2010. I recently reviewed her cycle of the Bach Cello Suites, set down in 1957-8 for Ducretet Thomson (300C043/5) and also issued by Forgotten Records (FR118/9 - review). There I expressed some reservations regarding her playing which, at times, seemed devoid of expression, and relentlessly metronomic. I was pleased to be given the opportunity to review this recent release of the two Brahms Cello Sonatas which she recorded in 1960 with the pianist Rolf Knieper, a pupil of Eduard Erdmann, Edwin Fischer and Claudio Arrau. Some of the problems which beset the Bach cycle are evident here. Compared with other cellists who have recorded this pair of sonatas, du Pré/Barenboim, Fournier/Backhaus and Tortelier/Engel, just three of my favourites that spring to mind, Schmidt de Neveu has a far more limited expressive range, and lacks the former players' striking musical personalities. She draws a thin, lean tone which is spare in texture and has a tendency towards tautness. Her sound is impersonal and monochrome, lacking tonal opulence. On the plus side, her bowing technique is a match for anyone, and intonation is spot-on. Of the two sonatas, the No. 2 in F major fares better. The Op. 38 lacks involvement, and I felt that the players were reading it through cold. They seem more at home and familiar with Op. 99, and imbue it with greater fire and passion. It’s paced well, with dynamics and phrasing judiciously chosen. Both sonatas are in more than acceptable sound, and the balance between the two instrumentalists does not favour one over the other. These superb transfers and re-masterings are taken from a French BAM LP (LD 063). Booklet notes are provided, which offer biographical portraits of the artists. 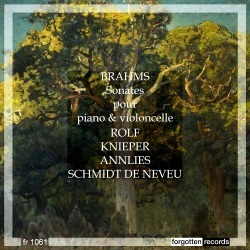 It is commendable that Forgotten Records are helping raise the profile of this long-forgotten cellist but, personally, Annlies Schmidt de Neveu’s playing doesn’t really float my boat.